How to Teach a Black Child: Books Like Me! I am feeling rather nostalgic...where have all the black book stores gone? I can't think of one local, black-owned book store where I can "shoot the breeze" about the Black experience and purchase Black-made products. I am especially concerned about the lack of black children's books readily available. I have a pretty huge collection of black children books and I often share them with the preschool through sixth grade students I tutor. I am discovering, however, that they are sometimes reluctant to embrace books with faces and names that reflect their own. Somewhat similar to the black doll test, they appear to shy away from books with pictures that look like them or validate their experiences. Instead, they make requests for books related to cartoon characters, television series or Dr. Seuss. 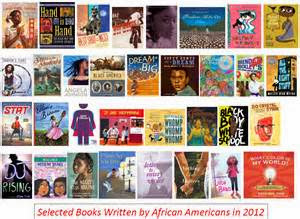 Though the cause of their preferences may be due to inferiority, self-hatred, white washing, commercialization or simply familiarity, I am more concerned about helping teachers and parents find stories and illustrations that racially and culturally connect to them than I am analyzing the reasons for their selections. There is plenty of research offering analysis and explanations for why black children do what they do but not enough being done to destroy and rebuild educational systems that continue to teach them to do what they do. You can start by "blackening" your own home library and demanding your child's school library and required reading lists contain black books. In my former position as a high school librarian, I intentionally purchased books written from an African American perspective in order to balance the human story as well as represent the school's student population. Some teachers thought the books failed to support the subjects/units they taught and others either quietly protested or secretively supported my efforts. Unfortunately, it is rumored that the present librarian weeded or discarded many of those black books. The point being, you will need to arm yourself with knowledge and supportive parents before attempting to change a white standardized system of education that preaches about practices of cultural relevancy, but rarely makes "courageous' cultural curriculum changes. Though you might be forced to deal with staff-- and even student opposition-- when making demands or changes within a public school setting, you are in complete control of determining which books you buy for your child's personal book shelf! Hopefully, if not now, your children will one day proudly proclaim and comfortably describe their collection as, "Books like me!" Please contact me if you are interested in building your child's personal or school library. I am a teacher-for-hire consultant working as a free agent to empower our children....one Black book at a time! I may be reached at: 424-777-5107 for fees and details!